November 27th, 2016 – Tonya Harding and Nancy Kerrigan were not present, but an ice skating rink still became alive with drama last night after a pair of figure skaters performed a Holocaust-themed routine. Former Olympic champion ice dancer Tatiana Navka, wife of Russian President Vladimir Putin’s chief spokesman Dmitry Peskov, performed with actor Andrey Burkovsky on state-owned Channel 1’s Ice Age. The duo wore striped concentration camp uniforms marked with yellow Stars of David and danced to a song by Achinoam Nini, which was used in the Oscar-winning film Life is Beautiful (the story of a Jewish-Italian bookshop owner, who relies on his imagination to protect his young son from the atrocities of internment in a Nazi concentration camp). During the nearly four minute performance, Navka and Burkovsky mimed shooting each other, playing with their child and being taken away by soldiers. They received positive praise from the audience and what appears to be a complimentary score from the judges (a format similar to our Dancing With the Stars program). It was online, however, where their marks dropped from judges who sat not on a panel but on Twitter. 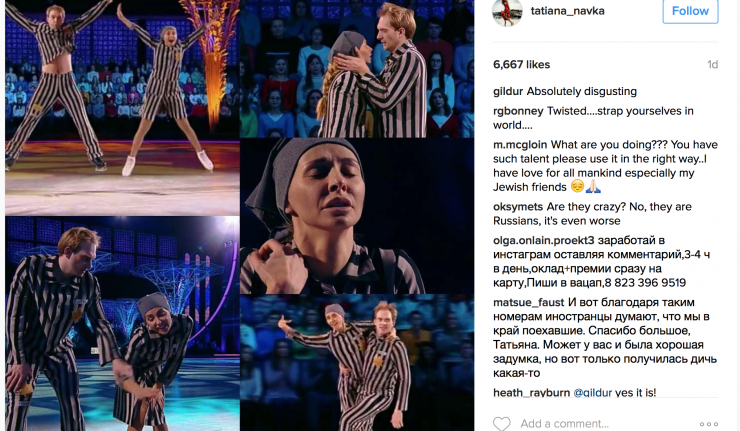 Navka gave a different perspective calling her performance “one of her favourite numbers” as she shared many photos and her hope for the number in an Instagram post. “One of my favourite numbers! Inspired by one of my favourite films, “Life is Beautiful”! You must show your children this film,” she wrote. Other people did not share her same vision and sent out tweets that called out the offensiveness and even mocked the mocking of the Holocaust. Watch the clip below and let us know what you think of the performance. Remember to vote Funny or Offensive to add your voice to the conversation.